We have been able to import Word documents into FrameMaker files for as long as I can remember, but with FrameMaker 2015 the process has been dramatically improved. 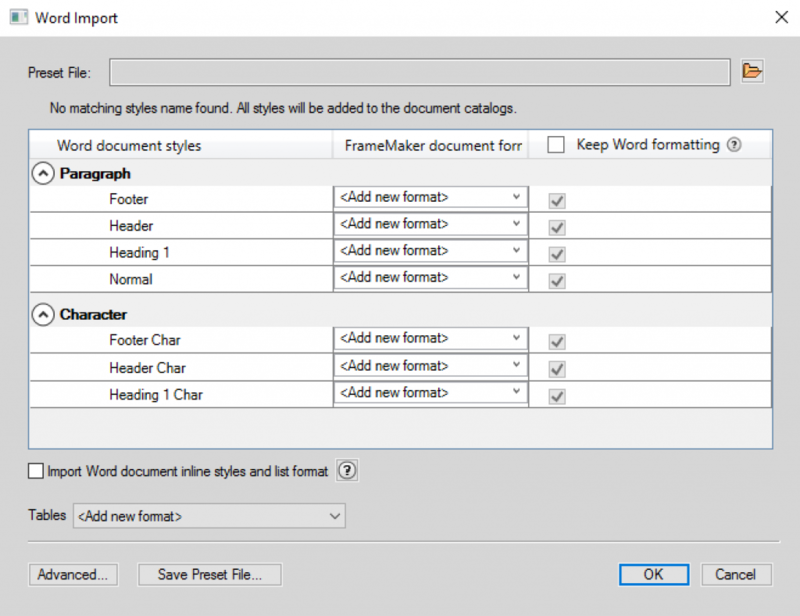 Now when you import a Word document (.doc file is recommended) into FrameMaker, you will be presented with a new dialog box offering style mapping for paragraph styles, character styles, tables along with the ability to remove excess white space. Let’s take a look. If your authors use styles in Word (and if they don’t, they should), you will now be able to map the existing Word paragraph and character styles to the styles found in your FrameMaker catalogs. In the example below, I am mapping the Word Header and Footer styles to Body (because they don’t come in anyway and I don’t want the new paragraph styles in my catalog) as well as mapping the Word Heading 1s to the FrameMaker spelling (no space) and the Word default style Normal to Body. In the past, I would have handled this through multiple Find/Change queries: one for each paragraph tag. You can do the same thing for character styles. Tables can now be assigned styles via this dialog box as well. 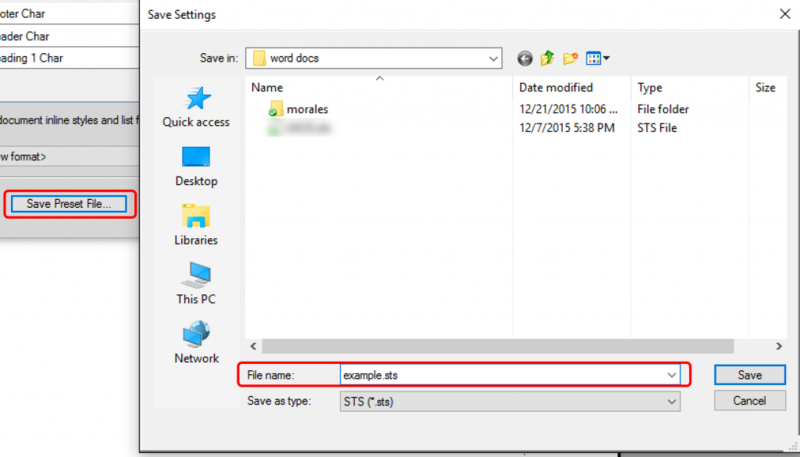 Simply select the table style from the Tables menu, and all the tables in the Word .doc file will be assigned the selected table style automatically. This little checkbox is easy to overlook, but most of us will want it checked. On my first FrameMaker 2015 project, I was so excited about all the time I was saving with style mapping, I completely missed it. After laying out the first 100 pages of my book, I finally noticed that all of the bold and italics had dropped out of my FrameMaker files. If you want the inline formatting (aka bold, italics, small caps, etc.) to show up in FrameMaker this must be checked, unless the Word user consistently used character styles (highly unlikely, in my experience). 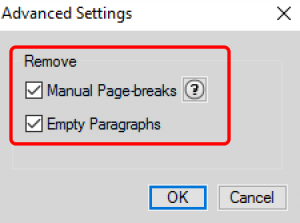 The Advanced button gives you access to two additional features: removing manual page breaks and empty paragraphs. We’ve been able to remove manual page breaks on import for years, but please join me in celebrating the automatic removal of the empty paragraphs! The first time you tackle this dialog box, it will take some time to figure out. But here’s the best news: once it’s working for your documents, you can save all of these settings as a Preset File. Once saved, for all future imports you can just select the .sts file at the top of the dialog box and all of your settings are loaded and ready to go. Thank you, Adobe, for this much needed feature. Glad to see you’re still around doing what nobody does better! I’m confronted with Word files of landscape letter size whose upper halves are tables with frames and photos in the cells. The lower halves are linked text frames with numbered instructions relating to the photos. I have to import these into portrait 5.5 x 8.5. Can Frame import this after I’ve done the mapping? Thank you for your work on these topics. Have followed some of your Youtube videos and articles like this. Am starting a migration project after not being in Frame for a few years. For the life of me, when importing, I CANNOT get the dialog boxes described here and elsewhere in help materials to show up. Everything imports and no styles are mapped from Word to Frame. No matter what options I select, am at a halt unless I choose to reformat everything. I concept, what I see above sounds great; the question is, WHERE is it? This feature was introduced in FrameMaker 2015. Which version are you using? This works with Word documents, and Adobe recommends that you save the current .docx files to .doc prior to using File > Import > File. Be sure to select the Copy into Document radio button at the bottom of the Import dialog box. If you choose Import by Reference, it will not appear. Thank you for this post. I’m having an issue with multiple Headings mapping to different Heading levels. In word they are 2, 3, 4, but in FrameMaker I need them to be 1, 2, 3. If I map 4 to 3, 3 to 2, and 2 to 1, they all end up as 1. If I map 4 to 3, 3 to 2, and 2 to 2, they all end up as 2. I suspect it’s because they have the same name “Heading 1” etc in both Word and FrameMaker. Is there a way to prevent this or do I need to go through FrameMaker changing the “Heading X” names? I recommend taking a few minutes to define the style names in Word—define a Heading1, Heading2 and Heading3 for the three heading levels, and assign them to your Word headings. New default FrameMaker documents have Heading1 and Heading2 already defined, so define a Heading3 in your FrameMaker document. This will simplify and straighten out the mapping.